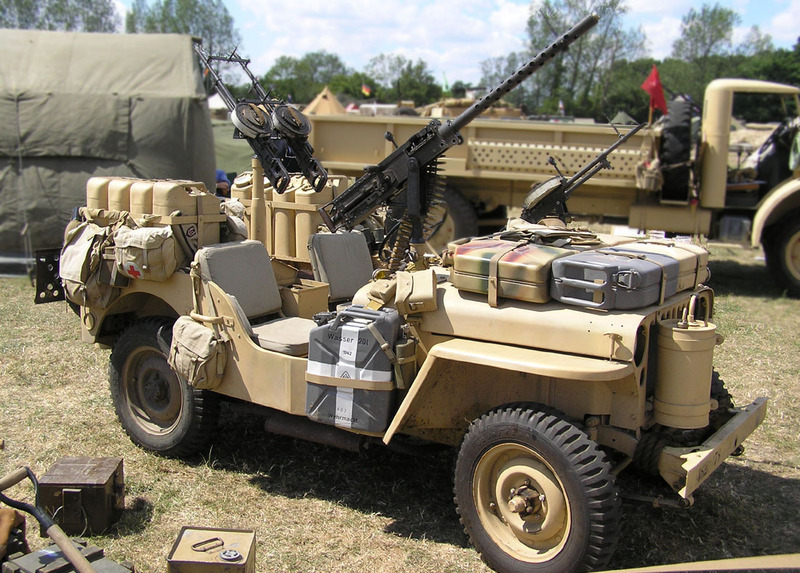 Accessories and spares for your WWII jeep.. Why?.....Because there are always those little extras you need if you are to stand out from your less ambitious jeep owning contemporaries. All the stuff you need to keep your pride and joy in pristine condition. This very tasty model was spotted at Beltring, but I hate to think how much those Jerricans would cost to fill these days! Just what you need to give Rommel 'what for' in an MB complete with three vickers 'K' air cooled MG's and a .50 calibre Browning M2A1. The 'K's were good for what the LRDG and SAS did best, storming into a desert luftwaffe base in the early hours and shooting everything that wasn't flying. Who knows what horrors lurk under the bonnet! If you've got your pride and joy stripped down and you need some WW2 jeep spares in a hurry - Try these guys. A young officer is working late at the Pentagon one evening. As he comes out of his office about 8 P.M. he sees the General standing by the classified document shredder in the hallway, a piece of paper in his hand. "Do you know how to work this thing?" the General asks. "My secretary's gone home and I don't know how to run it." "Yes, sir," says the young officer, who turns on the machine, takes the paper from the General, and feeds it in. "Now," says the General, "I just need one copy..."